Protein deficiency isn’t a myth. It seems as though sometimes people associate protein consumption with body building and weight lifting only, as if this macronutrient is more important for people who train hard in a weight room than the average person. First of all, protein is an essential macronutrient that everyone needs to consume whether they’re weight training or not (along with fat and carbohydrates of course). Secondly, the amount of protein consumed will vary depending on ones goals. Sure, someone who wants to hypertrophy (gain muscle) should eat more protein than someone who isn’t looking to add muscle mass. Regardless of what your goals are, you definitely can’t skip out on protein as it is essential to your health. Several people share a similar goal of losing fat while preserving muscle. 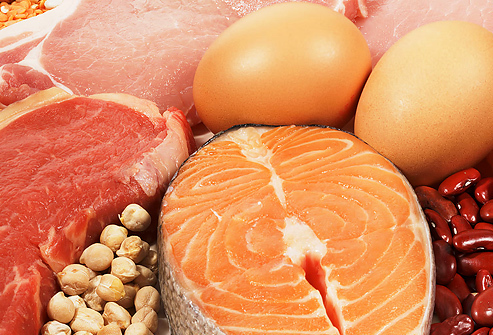 Let’s look at how protein works in the body and first get an understanding of amino acids. Amino acids are biologically important organic compounds. There are about 500 known amino acids. They are classified in several different ways including the form of protein. Outside of proteins, amino acids play a vital role in neurotransmitter transport and biosynthesis. In their protein form, amino acids comprise the second largest component of human cells, muscles and tissues; water being the largest. There are 20 standard amino acids and of those 20, 9 are considered essential for human health. These 9 can’t be made in the body and must be consumed through food. However depending on an individual’s medical conditions, others may become essential. These acids are constantly working to replenish the body’s tissues which is necessary for bone, muscle and organ health. Protein also assists with the production of hemoglobin in red blood cells, which is how oxygen is transported to the muscles and and organs. If a person is deficient of this macronutrient, the body may strip nutrients from bones, muscles and vital organs in attempts to repair itself, as well as lungs and immune system malfunctioning. Symptoms of protein deficiency are muscle weakness, diarrhea, weight loss, and fluid accumulation in the legs and abdomen. In severe cases it can lead to organ malfunction. There are several benefits to consuming a high protein diet. A person who consumes a high protein diet will burn more calories while at rest because the digestive system has to work harder to get the amino acids where they need to go, while also triggering the hormone that suppresses hunger. It’s common for those who aren’t eating enough protein, to consume too many carbs which can lead to higher insulin levels and fat storage. Higher levels of protein versus carbs will also lead to more energy, while excessive carb intake can make us feel tired. Animal protein (meat, eggs, and fish) contain the complete amino acid profile that the human body needs. If you’re eating meat it’s pretty straight forward to know that you’re consuming your 9 essential amino acids. Of course, protein is found in foods other than meat so if you’re not consuming meat it is important to understand which foods and combinations of foods will give you a complete amino acid profile. For vegetarians (not vegans however) whey protein is an easy and convenient way to get the essential acids. This can be consumed through powder mixed into shake form, or protein bars. Vega protein products are made for those wanting to wanting to stay free of animal products all together. There are also rice and hemp based protein powders out there so consult with your health supplement store representative about which option might be best for you. Although these powders are highly convenient and a good way to get in some calories and protein, it is important to get your nutrients through eating food as well. Some vegetarian sources of protein include: quinoa, nuts and nut butters, beans, lentils, and legumes. Soaking these foods prior to consuming and using them is a good idea as it makes them easier to digest. Although many people see soy products as a good way to consume protein I have not included soy in this list. Stay tuned for my next article where I will discuss why soy is not an ideal food choice. If you’re interested in finding out how much protein you need for your goals, please consult with one of our nutritional coaches. This can be done by emailing us at schedule@kalevfitness.com, calling 604-568-6006, or popping by our front desk.